Due to the nature of some of the questions I've received since I first posted this, as well as some criticism on the web that failed to understand what I wrote, I decided to go back and edit this post. I also decided to add a schematic of the audio section, where most of the confusion seems to have occurred. While it's the first thing I've ever drawn in Eagle, it should still help. Which is neither an endorsement of their software, nor my lack of drawing ability. I recently completed construction and initial testing of the CGS tube VCA using a 1SH24B tube. I built it in MOTM-format using a panel and bracket from Bridechamber. The version I built is different than the original circuit. In order to avoid damaging the PCB from excessive unsoldering, I did not first build a stock unmodified version for comparison purposes. From what others had said, there were three issues: the output was noisy, there was a "high-pass effect" or "loss of bass", and there was a "thump" during the attack of the EG when used as a VCA. These modifications address those issues. LED's are very noisy. 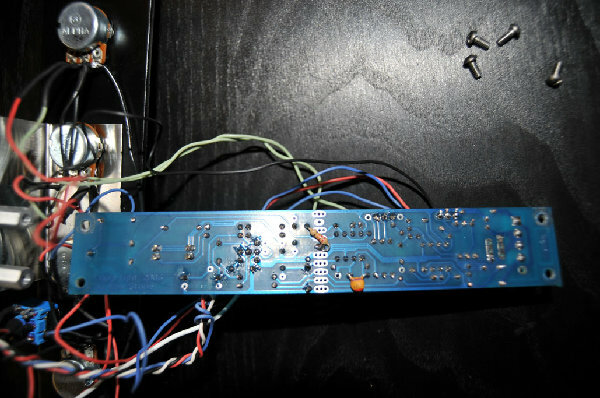 Since the cathode is in the signal path, I eliminated the two signal diodes, the two LED's, and their 1.5K resistors. I connected a 1.2K 1/2W resistor between Pin 1 of the cathode-heater and ground. I was out of TL072's. In order to use a fast op-amp (which would not be an LM358 or LT1013) to drive the grid capacitor that was better suited for audio, I replaced it with an OP275. The OP275 requires power bypassing to operate within specification, and the stock 100nF bypass caps are too far away to be effective. Also, the stock 100nF cap on the positive supply looks like it forms ~15kHz LPF on the tube output. So I eliminated those caps, and underneath the PCB, added two .1uF ceramic caps with heat shrink tubing going from ground, with the capacitors as close as possible to the power pins on the socket. The OP275 is designed to drive capacitive loads without requiring a feedback capacitor, and works better as a non-inverting amp if the parallel value of the gain resistors are less than 2K. So eliminated the 47pF cap. Originally, I simply replaced it with a resistor lead, and omitted RG. Later, I changed this for more gain, as posted below. The new values are shown on the schematic. If I used a TL072, I would have made both RG and RL ten times as much. While 330 Ohm is the minimum specified resistor for output protection of a TL072, and the OP275 has built-in protection against its output shorted to ground, I replaced it with 1K (outside the feedback path) to have the same output impedance as MOTM. In Ken's original circuit, the grid capacitor forms a high-pass filter with the (330K) grid resistor in parallel with the grid resistance of the tube. The grid resistance of the 1SH24B is specified as 100K. So the resulting corner frequency with a 220nF cap would be 9.4Hz -- not high enough to cause a problem, imho. However that specification is when the cathode-heater is run off 1.2V, which is not what we are doing here, so therefore the grid resistance is unknown. So I increased the two 220nF coupling caps to 470nF. At audio frequencies, the effective impedance of the plate is the plate resistor (8K2) in parallel with the load resistor (100K). Imho, coupling caps sound better driving lower impedances. So I changed the plate resistor to 20K and the load resistor (connected to pin 5 of the OP275) to 33K. 20K||33K = 12.5K yielding a bit more gain than the stock circuit. However, I do not think the "high-pass effect" noticed by others was largely due to the coupling caps. I think it was due to cathode depletion -- negative feedback that increases with lower frequencies. So I added a cathode bypass capacitor -- a 47uF axial electrolytic -- connected it between pin 2 of the tube (connected to the negative rail) and ground. Do not connect it to the ground side of the cathode or the in-rush current could burn out the heater. I decreased the CV input resistor to 50K so a 0-5V EG it has about the same range as the Gain knob. For the "clean" setting, I wired a 1M pot as a rheostat to -Ve, then adjusted it by ear. After I found the appropriate range, I added a 20K multi-turn trimmer to the board. There is an area with some writing without any traces to the right of the -Ve hole for the stock 330K resistor, where I drilled two extra holes. 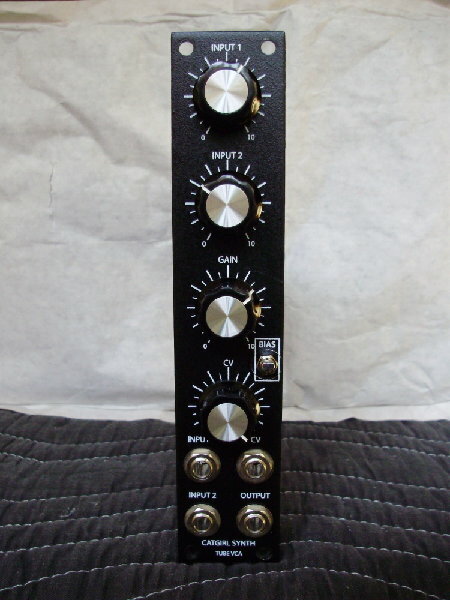 With a roughly 10Vpp source, such that there is about 3.4 VAC RMS on pin one of the OP275, with the gain and input knobs at maximum, the adjusting the trimpot for almost no distortion resulted in around 1K. Although knowing that, I wouldn't use a fixed resistor as setting it just right requires a trimmer, imho. Three things are happening as resistor value becomes lower: the grid becomes more negative, the level of the AC signal decreases, and the frequency of the high-pass filter increases. As such, there is some loss of bass, which rolls off gently at low frequencies. With or without a signal, the grid bias is equal to -15V, due to the low impedance. I would suggest using a 100K multiturn trimmer instead -- that way you could adjust a "clean" setting with the input potted down a bit for slightly better bass response. You also might want to try even larger values for the coupling caps. For the "distortion" setting, I found that a smaller resistor to ground produced more distortion, but was far less interesting with feedback. 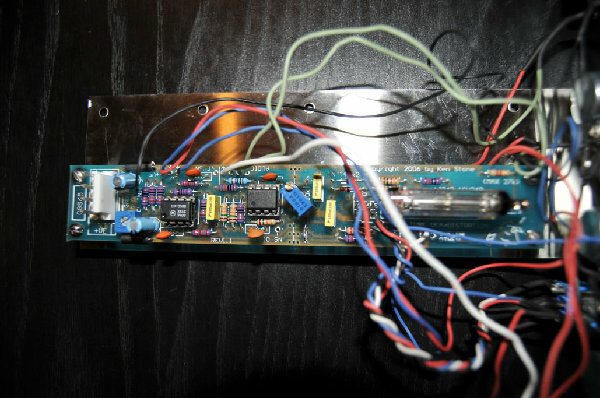 Having a rheostat on the panel (for either setting) wouldn't be a bad idea for those of you building this in a format that has the extra panel space. So I arrived at a compromised setting of 475K. It produces obvious distortion, and still produces oscillations at various input and feedback settings. The low frequency response is well below the audio range. The AC voltage on the grid is about 3.3 RMS. With a signal the grid measures around -17.6 VDC (it varies with its frequency), and without a signal the bias is around -14.1V. Regardless of the signal level on the grid, or the bias switch setting, the output of the tube, and therefore the module, is a bit below 1V RMS, as it seems that is the saturation limit of the tube. So while the signal on the grid is much higher for the distortion setting, the difference results in just that -- distortion. In fact, the "clean" setting measures just a bit more, although the "distortion" setting sounds louder to to the additional harmonics. Now 1V RMS is only about 2.8Vpp. Although it is enough on the mixing board, I might change the gain and feedback resistors to 2K (resulting in about 5.6Vpp) if it seems too low to work well with my other modules. The suppression grid was connected to the negative rail. I used Bournes conductive plastic 50K linear pots for all four knobs. While it likely varies from 1SH24B to 1SH24B, the tube I have installed is more than a bit microphonic. Clicking the bias switch is enough to produce ringing. So I stuffed some anti-static foam in between the tube and the board to minimize vibration. These modifications seem to have worked very well. Without an input, the output is very quiet. I don't notice any noise, hiss, or hum. While the LPF in the CV circuit is the same as the stock circuit, the cathode bypass cap improves the transient response of the tube itself. It seems likely that rapid changes in voltage on the control grid (eg. an envelope with a steep attack) would cause a sudden demand for plate current enough to deplete the cathode (if it were not bypassed), which then bounces back causing an unwanted noise. There is a bit of a pop or click with a fast envelope, although it is not any worse than most solid-state VCA's. Changing the signal grid bias, and switching between the two settings, also effects its CV response. As such, it is possible to all but eliminate any bleed, such that there is only a boost at the initial transient for punchy basses and leads. I found this while experimenting with different values. It would increase the distortion from the "clean" setting, but it would still be a very nice feature. I might add that with a SP3T switch. For those building this in other formats that might have he extra space, putting a bias rheostat on the panel would be a nice feature. Using a reversing attenuator for the second input/feedback control is another option, as negative feedback is also useful. So with these modifications there is very little noise, sufficient bandwidth, and it works fine both as a "regular" VCA and a distortion/waveshaper module. I am open to questions and comments. The LEDs are not in the signal path. 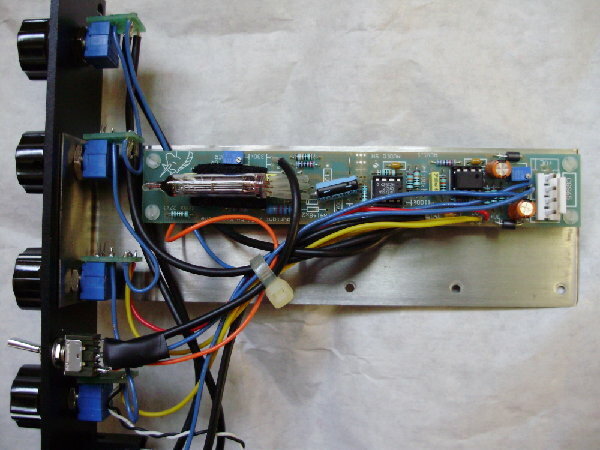 "Power for the heater is derived from the negative rail, by passing the current through first the heater, then some current limiting resistors with LEDs in series with them. Two resistors have been used to keep the dissipation within the resistors to appropriate levels. The LEDs are also using a little of the waste power." I was out of TL072's. In order to use a fast op-amp (which would not be an LM358 or LT1013) to drive the grid capacitor that was better suited for audio, I replaced it with an OP275. The OP275 requires power bypassing to operate within specification, and the stock 100nF bypass caps are too far away to be effective. Also, the stock 100nF cap on the positive looks like it forms ~15kHz LPF on the tube output. So I eliminated those caps, and underneath the PCB, added two .1uF ceramic caps with heat shrink tubing going from ground, with the capacitors as close as possible to the power pins on the socket. The OP275 can drive capacitive loads, and works better as a non-inverting amp if the parallel value of the gain resistors are less than 2K. So eliminated the 47pF cap on the output, and replaced it with a resistor lead. I did not add the gain resistor. While 330 Ohm is the minimum specified resistor for output protection, I replaced it with 1K (outside the feedback path) to have the same output impedance as MOTM. The grid capacitor forms a high-pass filter with the (330K) grid resistor in parallel with the grid resistance of the tube. The grid resistance of the 1SH24B is specified as 100K. So the resulting corner frequency with a 220nF cap would be 9.4Hz -- not high enough to cause a problem, imho. However that specification is when the cathode-heater is run off 1.2V, which is not what we are doing here, so therefore the grid resistance is unknown. So I increased the two 220nF coupling caps to 470nF. Regardless of the signal level on the grid, or the bias switch setting, the output of the tube, and therefore the module, is a bit below 1V RMS, as it seems that is the saturation limit of the tube. So while the signal on the grid is much higher for the distortion setting, the difference results in just that -- distortion. In fact, the "clean" setting measures just a bit more, although the "distortion" setting sounds louder to to the additional harmonics. Now 1V RMS is only about 2.8Vpp. Although it is enough on the board, I might change the gain and feedback resistors to 2K (resulting in about 5.6Vpp) if it seems too low to work well with my other modules. After spending more time using the tube vca, I found the output was not high enough to work well with other modules. So I changed the feedback resistor of the output amp to 2.2K and added a 1K gain resistor resulting in an output of around 8.6Vpp. This also improved the range of sounds when using feedback (I normalled the output to the second input using a switched jack). 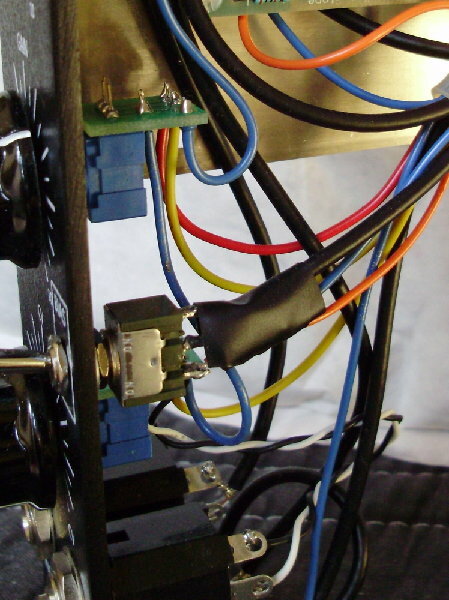 Here are some pictures showing the grid bias wiring and cathode bypass modifications. I'm putting together a few tube VCAs right now - very useful. Imho, there is no point in bringing the tubes out to the front panel. They do not glow, and even if they did, how interesting is a steady glow?? Also, I just got a new idea. For those with the panel space, instead of using a switch (ground/-15V) and a rheostat, how about using two pots?? Wire the grid to a rheostat, then to the wiper of a pot set up as a voltage divider between -15V and ground. If you used a buffer, you could even normal the -15V to a CV input jack. Please note that I have not tried this myself. i just built one stock and im about to build 2 more with your mods PS. well, truth be told i used silver mica caps instead of the specified ones as they were the only thing i had around. the stock one sounds awesome, i get no hum. > I have TL072s here, is it beneficial to move the 100n caps closer to the chip sockets? > The 47uf axial attached to Pin 2, does that mean i cut the trace to -V, or does it just jumper to ground. oh which way do the poles go? i assume + on the ground side, just checking. I have TL072s here, is it beneficial to move the 100n caps closer to the chip sockets? The 47uf axial attached to Pin 2, does that mean i cut the trace to -V, or does it just jumper to ground. oh which way do the poles go? i assume + on the ground side, just checking. The positive side of the cap goes to ground, and the negative side goes to where the negative rail connects to the cathode. Do not put the cap on the other side or the inrush current could burn out the heater. I did not cut any traces. I pretty much ignored the labeling on the PCB and used whichever combination of traces and holes worked. It might help to use a continuity tester or hold the PCB up to a light to figure it out. My modded version (one cap, one resistor) is actually simpler than the stock circuit (two resistors, four diodes) so there is plenty of room. Also, pin 1 and pin 2 on the tube are interchangeable. did you use the original pcb for your version? or did you make your onw pcb with modifications? I Want to hook up some LEDs to show the CV coming into the module. Can i just use a normal bc547 LED driver but run the rail from the surplus power of the tube like the current LED position. I would like to use the LEDs currently in the module for this purpose. so could Pin1 from the tube be ok to ground to my DG instead of the normal ground. Also to do with another tube module, but modding it also to include Audio Ins like the CGS one. 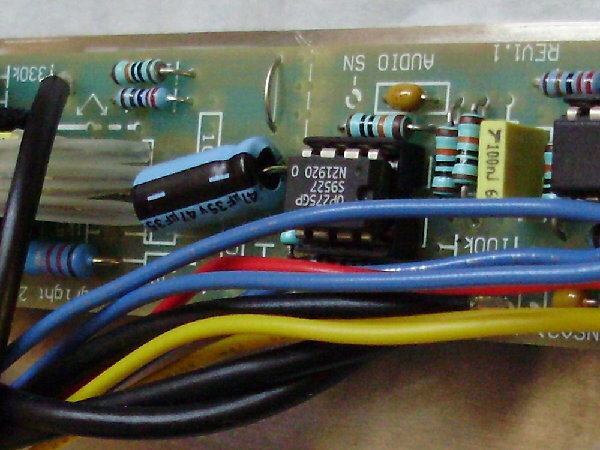 the audio inputs are fed into an opamp, TL072. Why is this? Does it just buffer the signal? Crap, I just saw this now. That will not work at all. You could put separate LED's behind the tube and and run them off a buffered LED driver. I suggest using an op-amp. so all LEDs are going to ground to that, so could Pin1 from the tube be ok to ground to my DG instead of the normal ground. One of the reasons I eliminated the diodes in my version was to keep noise off the cathode. Why would you want to connect the cathode to a noisy ground?? It's part of the audio signal path. I'm not a big fan of passive mixers or low input impedances, ymmv. The input amp in the CGS circuit does three things. Firstly, it is an impedance buffer. 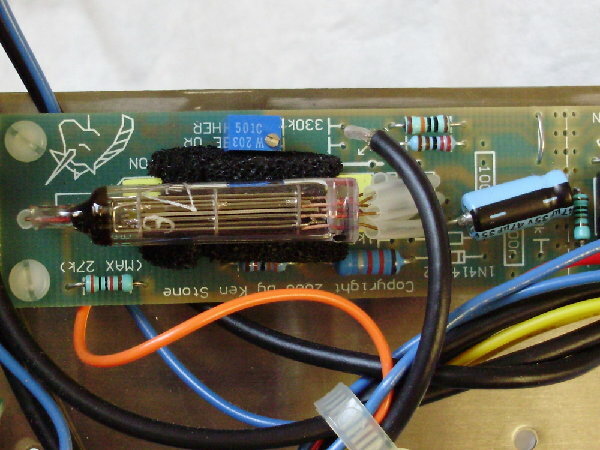 Secondly, using an inverting amp compensates for the inversion of the tube. Thirdly, it provides the mixer function. Hello all, please, might I steal a little of your time? I have built a CGS65, I bought a kit to Bridechamber and followed the instructions on Dragonfly Alley, making all the mods described there. Well, the module is not working. There is no sound nor response from any knob and the LM358 gets really hot very fast. However, if I remove the jumper (the one in the middle of the PCB), the audio path seems to be working, the input 1 and 2 jacks and pots work although the CV and gain don't. Please, do you have any clue or help? A hot IC usually means something is shorted somewhere, so have a close look for solder bridges. If the 358 gets really hot, it is probably cooked(=dead) now, tho 'usually' one of the 10 ohm resistors would smoke up first. Anyway if it is the -15V for the 072, you need it. have you checked the op-amps are getting the correct voltages on their power pins? another common prob (at least for me) with this PCB is ensuring the tube is installed correctly. i would like to interface the CGS 65 tube VCA with an ARP2600. i'm going to follow Bill & Will instruction. because i appreciate a low noisefloor if possible. Am I right ? is there any other mod needed when doing those ? it seems i can manage to get the 20Vpp from the output. but i have no idea if it will fit with the ARP2600 impedance. do anyone has info on this ?? will it be as simple as raising the 15K between input pot (100K) and TL072 pin 2 ?